Out of Savana La Mar, Jamaica, Keith Porter and the Itals are some of the hardest touring road warriors in the reggae arena. Known for their tight harmonies and songs of glory, these reggae messengers have been going fresh and strong all over the world since the early eighties. They are true samples of the “Rasta Philosophy”. May 2007, they will be touring North America again. Interested parties contact Peter Wardle of Kings Music International for bookings. “ Got to reveal. Got to reveal. Truth that is hid – got to reveal”, chant The Itals. “Sing farewell to my enemies. Sing Farewell to my enemies – Alphas love is over me.” Songs to make us remember God and focus on His great blessings to humanity. The success of “Ina Disa Time” saw the group return to the studio with the addition of Lloyd Ricketts singing a third harmony part on a series of superb recordings for the SpiderMan label. Tunes like “Don’t Wake The Lion,” “Brutal,” and “Temptation” followed on 7” release in Jamaica and New York in ’77 and ‘78, establishing the Itals among the best Jamaican singers and songwriters. The Itals were twice finalists in the Jamaica Festival Song Competition, and their 1981 tune, “Jamaican Style,” earned them a place at Reggae Sunsplash that year. 1982 saw the release of the first Itals’ album, “Brutal Out Deh” on Nighthawk Records. The Itals toured the US and Canada backed by the Roots Radics. 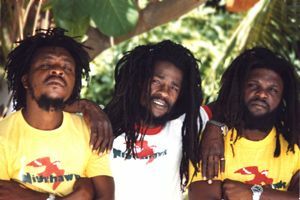 Their second album, “Give Me Power,” was released to critical acclaim and hit #1 on CMJ’s Reggae Route chart. In 1985, Pollstar Magazine placed them in the top 100 artists of the year.